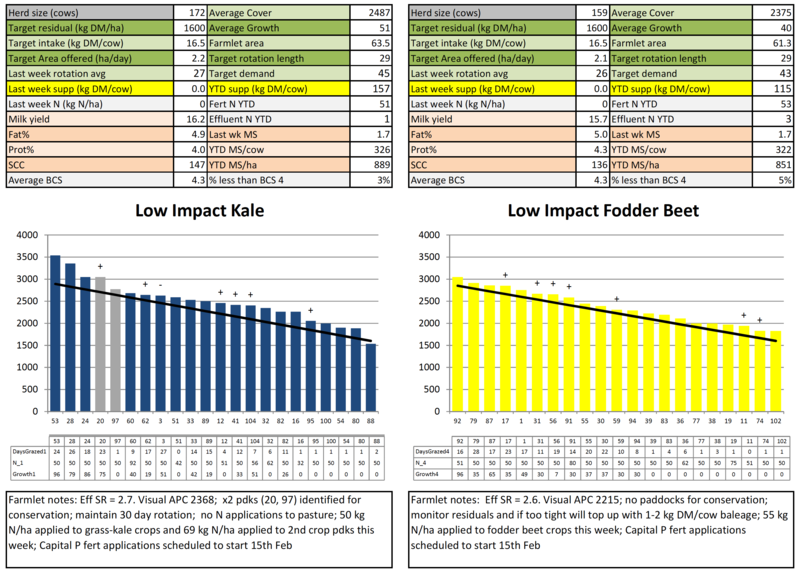 From the feed wedges, LI Kale (x2 pdks), Std FB (x1 pdk) and Std Kale (x3 pdks) have been identified for conservation this week. The LI FB farmlet grew below demand this week and is not in surplus. The x1 runout short rotation paddock (2.9ha) in the Std Kale farmlet that was sprayed out 10 days ago has been surface worked in preparation for regrassing. Reseeding will occur with perennial ryegrass and white clover. Direct drilling was considered, however the paddock was used to run cows on and off during transitioning to crop in winter 2017 and sustained mild pugging damage. x2 paddocks at the support block (3.2 ha) were sprayed out this week and will be fully cultivated in preparation for regrassing. The round length will continue to be held around 30 days for the next 2 weeks with the intention to use our next application of N towards the end of February/early March to push it out to 35 days in March. We have been using 24-hour grazings for all the herds for the last 10 days. This, combined with removing surplus paddocks for conservation to have cows grazing paddocks at the target pre-graze mass has resulted in more consistent and even residuals across the farmlets. If necessary cows are being put back into paddocks after the morning milking to clean them up. 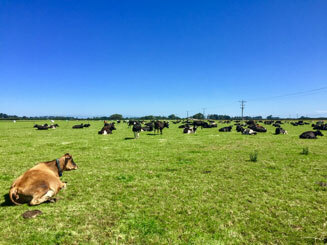 The farm team have noted that when cows are initially put back to clean up a paddock they will often go in and lye down for a few hours before getting up and grazing. Below is the residual reached by cows sent back to their paddock to clean up after the morning milking. This photo shows the cows to be very full and content just before afternoon milking. In the table below is the area conserved and number of bales made on farm last week. There was a wide range in the number of bales made, with the Std FB having the largest area conserved. The supplement conserved from each farmlet season to date ranges from 148 to 242 kg DM/cow. As we are currently targeting baleage for milking cows the paddocks were identified and conserved within 7 days rather than giving them an extra week to bulk up. This also allows us to get the paddocks back into the grazing rotation within a week. The R2 heifers were scanned this week with an empty rate of 8.3%. They were also weighed, averaging 376kg Lwt. Cows were BCS again this week. 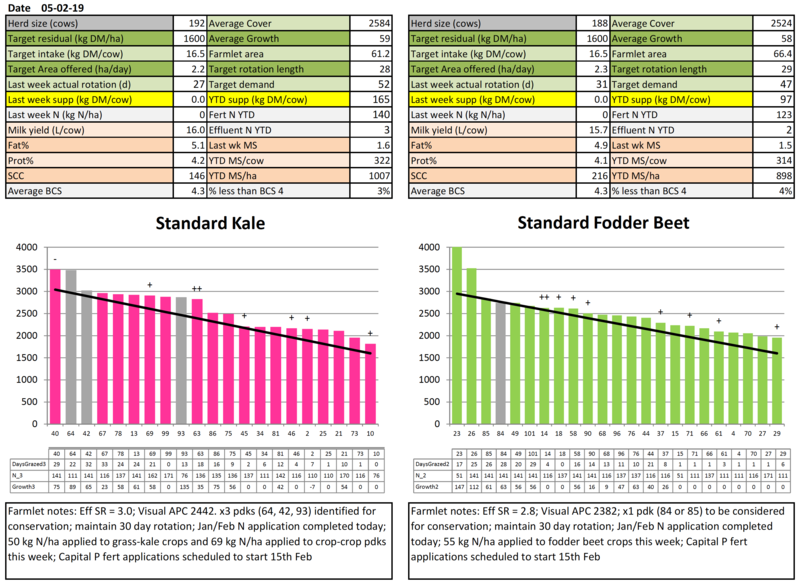 There has been a general improvement in BCS across the herds but the biggest improvement was with the Std FB cows. When scored a fortnight ago, 10% of the Std FB cows were at BCS less than 4, this week the percentage had significantly reduced to just 4%. For those that missed last week’s 6-week in-calf rate, we have included the summary again this week. The effluent area has been extended out to the Makarewa block of the farm with the recommissioning of the old Alliance effluent network. This will allow and additional 21ha to be irrigated with effluent (27ha including x2 crop paddocks). There are X2 paddocks in the block that cannot be irrigated due to their distance to hydrants. Bolters observed in our first-year fodder beet paddocks and wild turnip in all crop paddocks are being pulled as they are being seen. Currently there is X6 calves on the milking platform consuming approximate 2 kg pellets/day (half a bag) and X46 lighter calves at the support block receiving 2.2 kg/calf/day. The calves are looking much better and next week will be weighed and redrafted to ensure those below target liveweight continue to receive preferential treatment. With things a little quieter on the farm at present the farm team are using the time to get on top of general farm maintenance and to work on procedures that will improve the efficiency of tasks on the farm. Next week we will complete the February N intake estimates across the 4 farm systems. 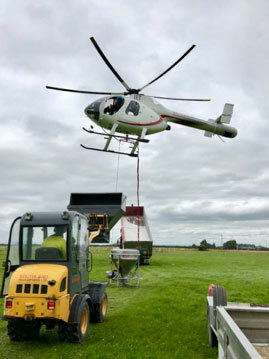 This involves pre and post-plating all the paddocks grazed between Monday afternoon and Friday morning and collecting pasture and supplement samples for N analysis.